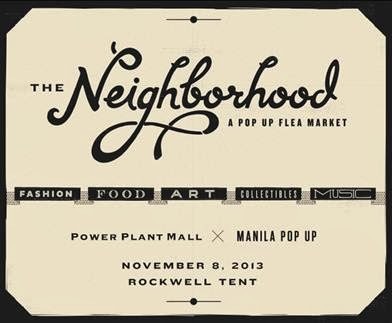 Experience fashion, food, art, collectibles, music, and the first food truck meet up—all in one place as Power Plant Mall and Manila Pop Up present The Neighborhood Pop Up Flea Market at the Rockwell Tent, Makati on November 8, 2013. The Neighborhood is a pop up node in the city where all your favorite places come together. Streets lined with constant fashion brands, the friendly next door barber, the best drinking spots serving strong libations, a creative group of artists, up and coming chefs and many other retail outlets. Of course this wouldn't be complete without a line-up of bands to keep you company throughout the day. 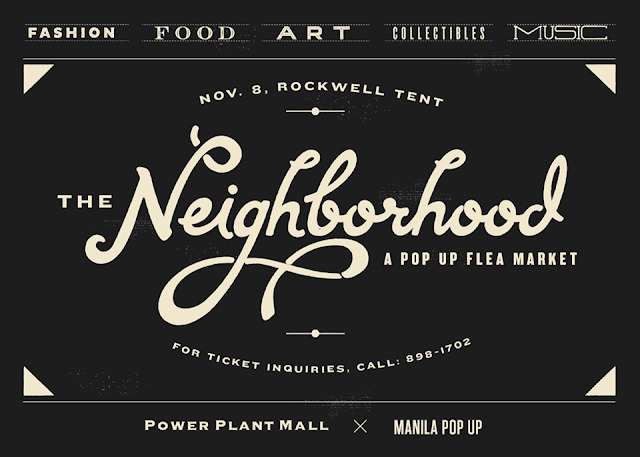 Opens from 11AM until 12MN, The Neighborhood features live portraits by Anjo Bolarda and live art by the PSP Graffiti Crew, Get tattooed by Snow Tattoo's very own Sarah Gaugler, Barber Shop Pop Up with Hair cuts and Shaves by TITAN, a Pop Up Gallery Installation by Vinyl on Vinyl Art, and On site Silk Screening by Team Manila. Enjoy the neighborhood experience with musical performances by Yolanda Moon, Nouval, Sinyma, Your Imaginary Friends, and Turbo Goth. Limited tickets available. You may purchase the tickets at the Power Plant Mall Administration Office, P1 level from 10AM to 8PM today (November 6) and tomorrow (November 7) to make sure you won't run out on the day itself! Tickets are priced at Php 250. For ticket inquiries, contact 898-1702. This is cool! A place wherein fashion, music and food lovers come together and enjoy the showcase of artisan, chefs, bands, etc... A get together party for affordable but exciting activities in Neighborhoods. Congrats to all the organizers. aw turbo goth is something to look forward to in this event! i wish i can go, but yes, the weather makes me hesitant about going out! yay! Sounds promising. Great food. Great drinks. Great entertainment. A promising place to spend your all-out charade of exploring the present-day lifestyle. Wishing you the best of everything....enjoy while life is in your hands. Powerplant mall and rockwell used to be my hang out place when I was still in grad school and the place just is great. I'll try to drop by this weekend.